Apple introduced its own ‘QuickType’ predictive text keyboard, but this takes time to adjust to your usage pattern. It’s possible to download a third-party keyboard and my personal favourite is Swype (99p). This lets you drag your finger across the screen to type out words and has a great prediction feature. 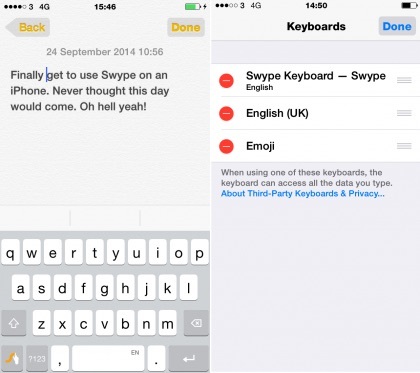 SwiftKey is also a popular keyboard on Android, but so far it’s reviews aren’t quite as good as Swype on iOS 8. If you want to use a third-party keyboard as your primary form of input you need to go to Settings > General > Keyboard > Edit and then drag it to the top of the list.